“It’s about time,” Aaron said, obviously exasperated. “I want to make a suggestion,” he said. Because she’d just recommitted herself to getting over him! And Riley was going to help her by giving her someone to talk to and do things with. She planned to take the hand she was being offered. “You’re serious? You won’t go out with me?” He was justifiably shocked. Two years ago she would’ve burst into tears of gratitude and relief if he’d tried to legitimize their relationship like this. “Of course it will. We’ll go right back to what we’re used to.” Her body yearned for him even now, when she was feeling some conviction. How much stronger would that desire be in the moments she wasn’t? “Then date him, too,” he said grudgingly. Brenda sold her first book, and the rest is history. A New York Times and USA Today Bestselling author of fifty novels, Brenda Novak has been nominated for a prestigious Rita Award three times and won The National Reader's Choice Award, the Bookbuyer's Best, the Bookseller's Best, the Writer Touch Reader Award, the Golden Quill, the Hold Medallion and the Award of Excellence, among others. One commenter from the entire tour will win a Brenda Novak Mini-tote and an autographed collection of the first 3 books in the Whiskey Creek series (When Lightning Strikes, When Snow Falls and When Summer Comes). This contest is open to all US & Canada residents of the age of majority. Please see full Terms & Conditions on the Rafflecopter widget. Hi Brenda! I was wondering how many more Whiskey Creek books we can expect? Did you have a set number when you starting writing them or do you just roll with the characters? Congrats on the new release! I enjoy reading the Whiskey Creek series! Haven't read them all but I'm looking forward to catching up to Come Home to Me! Thanks for sharing this wonderful giveaway and the lovely facebook release party! I love the Whiskey Creek series but I keep wondering how you come up with the ideas for your stories. I am only recently acquainted with the Whiskey Creek series so it would be wonderful to win this giveaway, especially since I didn't win any of the release day giveaway prizes. It was fun participating though. Thanks Ms. Novak!! 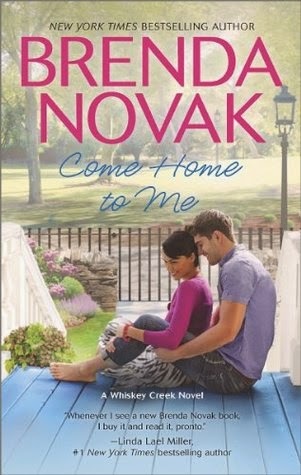 I'd like to give a shout-out to my "neighbor," Brenda Novak, and wish her continued success. As a resident of a "ruburb" of Sacramento, I'd like to let you know that your community is very proud of you! I had fun at the FB party and am looking forward to reading this book. Thank you for the excerpt! Can't wait to read this one.